One of the main episodes of the repression exerted against the Armenian leadership in the initial phase of the Armenian genocide was the case of the Hunchakian Party activists who were hanged in Constantinople in 1915. The Social Democratic Hunchakian Party was founded in Geneva in 1887 by a group of Eastern Armenian students. It had pursued revolutionary activities with the aim of the self-defense of Armenians in the Ottoman Empire. After the Ottoman Revolution of 1908, it maintained a certain distance from the Young Turk party. The coup d’état of early 1913 that practically concentrated the power in the hands of a triumvirate (Talaat, minister of Interior; Enver, minister of War, and Djemal, minister of Navy) was not well-received by the Hunchakian Party, which was concerned with the safety of Ottoman Armenians. The 7th General Convention of the Party, held in Constanta (Romania) in September 1913, stressed that the dictatorial government of the Young Turks would make impossible that the aim of an independent Armenia (which was the declared aim of the party in its political program) would be accomplished. 1. The party would become again a clandestine organization. 2. It would carry a plan to assassinate the leaders of the Young Turk party. An Armenian double-agent, who was also a member of the party and attended the meetings, reported these developments to the Turkish government. The Ottoman Armenian delegates to the convention were arrested as soon as they went back to Constantinople. By the end of 1913, a total of 140 members of the party had been arrested. Lengthy mock trials followed, while the prisoners endured terrible conditions in the Turkish prison. Finally, twenty-two members of the party were sentenced to death by hanging. The sentence was carried out for twenty of them (two were fugitives) on June 15, 1915, in the central square of Constantinople, known as Sultan Bayazid Square. 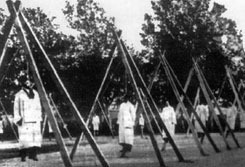 As one of the prominent Hunchakian leaders, Paramaz, who was among the sentenced, said before his hanging, “You can only hang our bodies, but not our ideology.” The sacrifice of the Twenty Hunchakian gallows, also known as the “Twenty Hunchakian martyrs,” became an example and inspiration for political action of the following generations.